In recent years China has become the largest producer of advanced generation LCD panels, ushering in great opportunities for the upstream polarizing film industry, producing thin optical filters applied to the panels. However, the technology, research and development, production and sales of this industry are dominated by foreign enterprises with low domestic market share and a huge market gap. 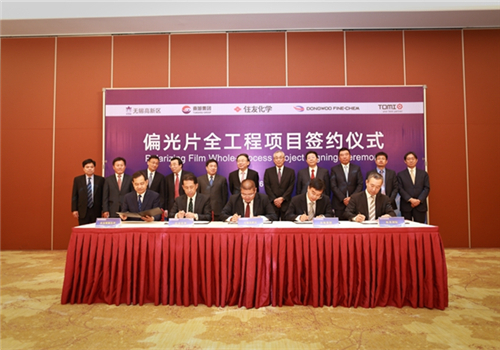 A polarizing film whole process project worth 2.07 billion yuan ($320 million), jointly invested by Tunghsu Group, Japan's Sumitomo Chemical, South Korea's Dongwoo Fine-Chem, and Hong Kong's TOMI International, was signed in Wuxi National Hi-tech District (WND) on April 25, the Wuxi Daily reported. The project is expected to start construction this August and go into operation the following August in 2017. It is scheduled to complete an annual production of 20 million square meters of polarizing film and achieve gross sales of 2 billion yuan ($308 million). The project will also expand the agglomeration effects of LCD upstream industries in Wuxi, making it an important production base in China. 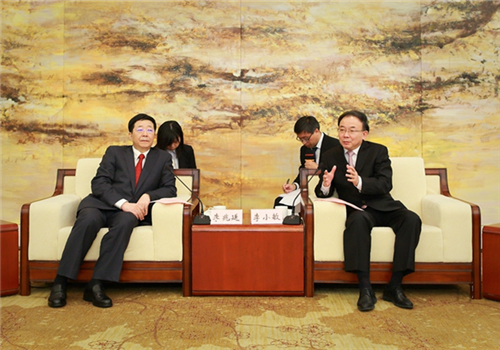 Li Xiaomin, Wuxi Party secretary, attended a signing ceremony and met with Li Zhaoting, chairman of Tunghsu Group, a Chinese polarizing film specialist, and his counterparts, to discuss strategies and projects to upgrade modern industry and innovation. Li expressed his appreciation for the companies’ contribution to Wuxi’s economic development and his desire for the city to strengthen ties with these companies to help establish a highland of modern industry and improve the local economy. Li said that the high-end manufacturing project enjoys the highest investment introduced in Wuxi so far in 2016, and corresponds with the government's decision to transform and upgrade local industry to further develop the local open economy. He added his hope that this project spur on more foreign investment. Li Zhaoting, gave a brief introduction of the background and specifics of the project. He said that WND’s geographic advantage, solid industrial foundation, first-class government service, brilliant business environment and former successful investment of Sumika Electronic Material are all good influences for the project. He added that with its shareholders, Tunghsu will focus on Wuxi, and make it the most successful project in China and attract more projects to the city. Deguchi Toshihisa, representative director of Sumitomo Chemical also showed his appreciation for the local government’s great help in its success in Wuxi. He added that this project will contribute to Wuxi and China’s LCD panel industry through mutual cooperation.